I wasn't looking forward for today's on call, as i was quite tired myself, although I am hoping I'll manage to learn new things, and guess what? Alhamdulillah, I have. The two extremes that I've seen today taught me a lot and reflected just what I want to do in the near future insyaAllah. Let me set up the scene, the 1st scenario; A 21 y/o patient, full time housewife. Having her partner and mother by the side during her delivery was just perfect. She delivered a healthy baby boy by normal vaginal delivery/NVD. I cried,it's too beautiful and overwhelming! and at the same time it made me think, is this what I want in my life? A full time housewife, with a lovely husband,children and parent by my side? Second scenario, well it is actually not a story to tell, just that most of the consultant/STs' are very committed to their work, they stayed till night, and they are so good at what they do. Each of them is so inspiring that they helps me build my interest in obs n gynae (as I am not really keen on it 1st, hearing how tough and demanding this field is). But, to get where they are now just require tonnes of sacrifice, in this matter, your family.Most of them are single! Reminding me again about that email , 'diari seorang dr.'. No doubt I wanted to be like them, to have the competency and skills to help others, to be at the top notch but is that all that I need? Do apologise for the bm translation, too lazy to change them. But there you go, that's the answer. Not just in this ayat but also in al-baqarah, Allah mentioned that we are ummatan wassatan (2:143) which means being fair,moderate and anything that goes along with it. In my case, only Allah knows this burning love for medicine, for the greater goodness of others but I do love to have my own family. Thus, finding the right BALANCE is the key to succeed, not just here, but for definitive happiness in the hereafter. Allah never entails your destiny, never reveal your own limitation for a reason, and that is so that you will reach for the star, for the impossible to be possibled! Just because He know His servant is a special creature, even though the angles would deserve it more! So grab that chance that Allah has given us! So my dear friend, DREAM for the impossible, if Allah get you to it, Allah definitely will get you through it! with conditions though, which is with hardword and sincerity comes ease. O Allah, I can never be thankful enough to You. Keep me steadfast in this path. May I be able to sacrifice everything I have for Your cause.Ameen. p/s: This maternal instict is pressing on me. May Allah give what's best for me.Ameen. 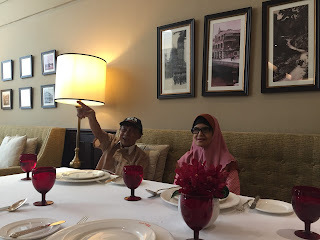 sehari bergaul dengan mat saleh, lidah dah terbelit.huhu.